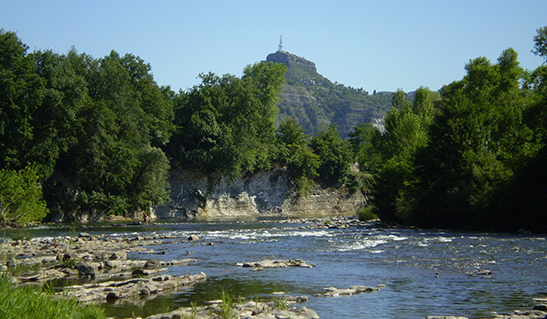 Campsite Ardèche » In the campsite’s immediate surroundings, discover the beautiful Ardèche. 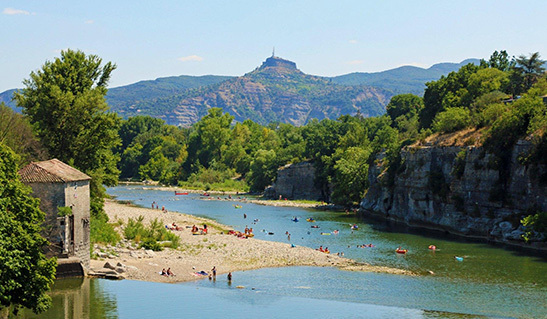 In the campsite’s immediate surroundings, discover the beautiful Ardèche. 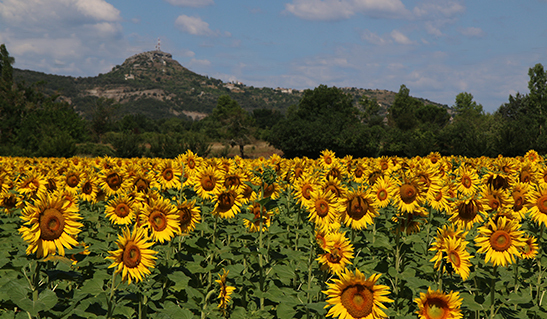 Our campsite is ideally located in the heart of Southern Ardèche. Visit wild and pitoresque territories and embark on a real geographical historical and cultural journey. 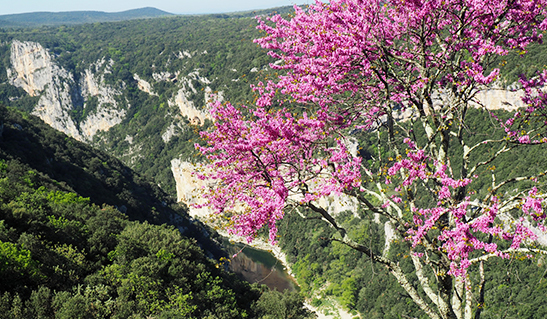 Discover the region’s scenic villages, visit the Pont d’Arc bridge, and go on hikes in the nature park and Gorges of the Ardèche reserve. In addition to being ideally situated, just a few kilometers from the town centre and the tourism office, the closest supermarket is a 25-minute walk from the campsite, along the greenway that runs alongside the campsite. By car, it’ll take you 5 minutes to get there (2.5 km). 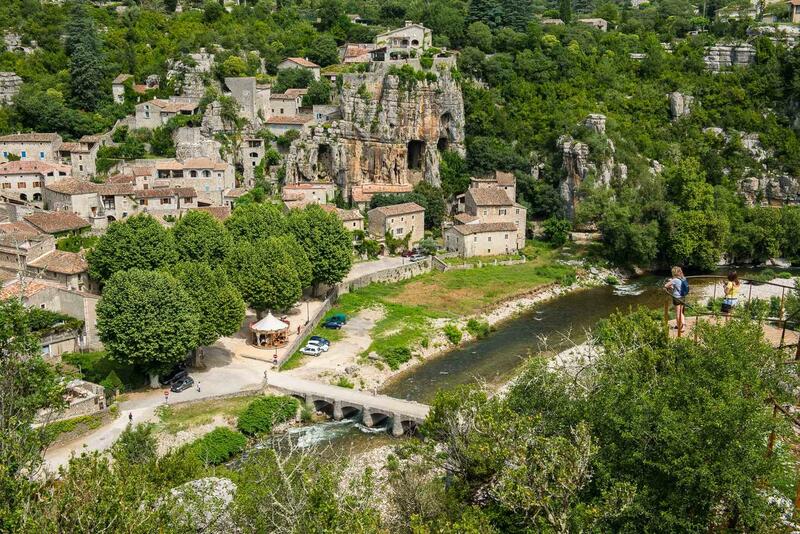 The village is located fully South of the Ardèche, at the confluence of the Ardèche, Beaume, and Chassezac rivers, and close to the Gorges of the Ardèche territory. Ruoms is part of the canton of Vallon-Pont d’Arc. 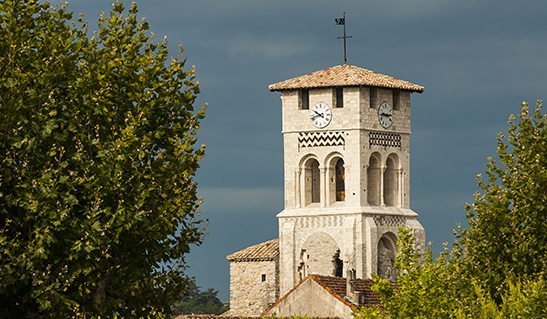 From medieval vestiges to wineries, come and learn about the cultural heritage of the town and stroll through its quaint streets. The campsite is located 2.5 km from shops: you’ll find a shopping centre with a supermarket and a petrol station. Your holidays made easy! Direct access via the greenway, on foot or by bike! On offer in Ruoms throughout the Summer season: circuses, monster truck shows, and more! RUOMS also has a cinema! The Défilés du Ruoms and Ruoms Gorges has roads built in the 19th century and connect the Cévennes region forecountry (Ruoms) and the central Ardèche valley (Largentière). “Villages of character” is a quality charter that bringing together villages with a strong historical past, and that show their determination to preserve their heritage while still welcoming curious visitors. Come and discover them! Balazuc, awarded the “Most beautiful villages of France” nomination: wander through the town’s calade maze for a real taste of the South! Banne: its shady square, medieval fort and 12th century church are located at the foot of the Cévennes. Labeaume: roam the town’s surrounding scrubland and depart on a quest to find the 140 dolmens! To end you day, visit the town’s suspended gardens. 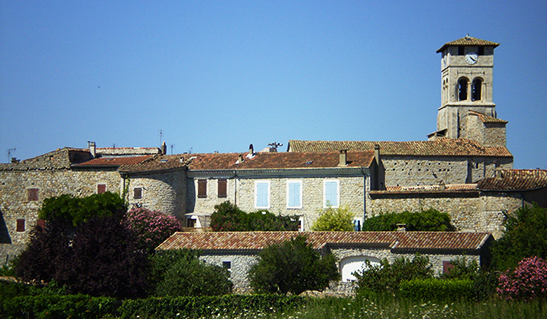 Vogüé, visit the “Château des Seigneurs” castle and wander through the narrow streets of the village until you reach the river beach. 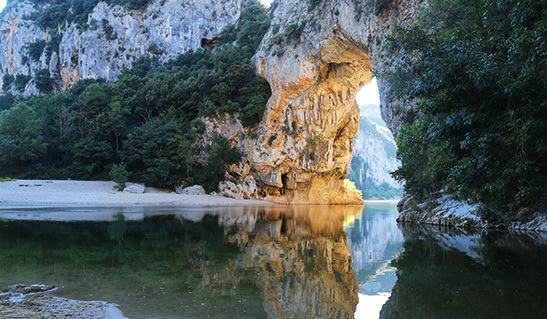 Vallon Pont d’Arc is located at the gateway to the Ardèche Gorges and its famous Pont d’Arc, a true nature reserve. 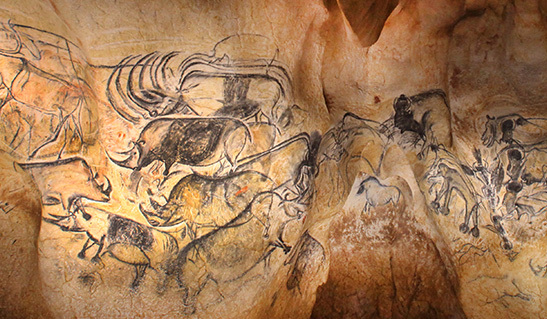 This spectacular limestone canyon has been dug over the centuries by the Ardèche river, the emblematic arch of the 54-metre high Pont d’arc is now a UNESCO World Heritage Site with the Chauvet cave, known as the Grotte Chauvet II, Ardèche. 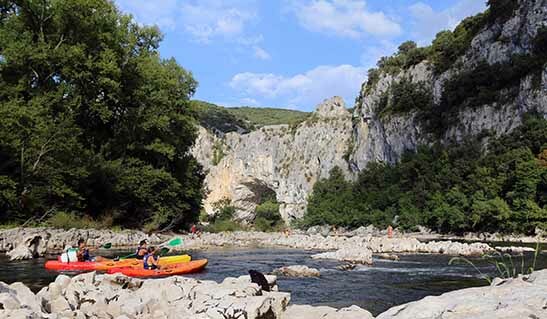 With its panoramic road, its many viewpoints, and its wild goats, the gorges of the Ardèche attract many visitors every year in search of discovery, escape, and outdoor activities: hiking and canoeing. The Ardèche is a region you can almost literally eat! 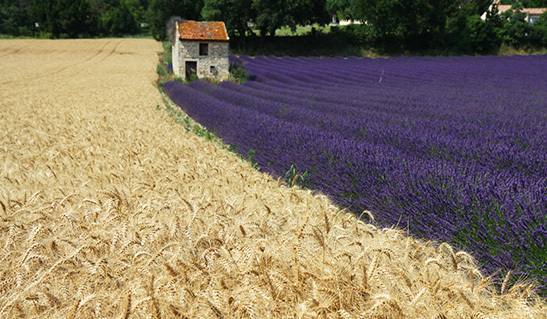 Arouse your taste buds at typically provençal Summer markets! On the menu: goat’s cheese, Ardèche charcuterie (including the well-known Caillette), olives in as many different forms anyone could possibly think of (as tapenade, to savour poured on a spoon, etc. 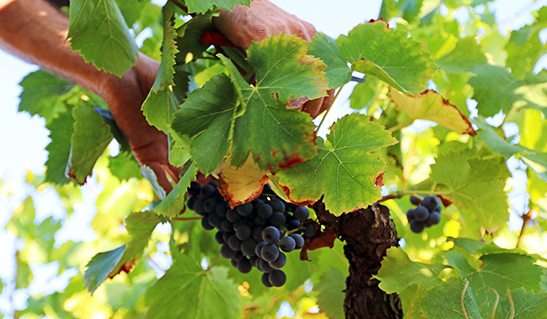 ), wine, and the region’s sun-gorged fruit and vegetables. But don’t forget to make a stop to discover the region’s renowned chestnut produce! There are many museums around the Chapoulière campsite. They tell the story of the region’s savoir-faire and heritage. Discover our beautiful region by visiting these educational sites. 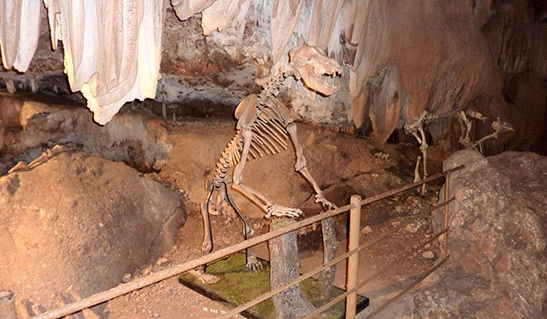 The caves of the Ardèche are an integral part of Southern France’s cultural heritage. Visit remains of the prehistoric era and let yourself be subjugated by the beauty of these natural caves, created gradually over time. To access the Aven cave, visitors have to climb a set of steps. Other natural subterraneous caves have at least one portion with horizontal access. Whether they are simple ruins of the past, under renovation or preserved and even classified as “historic monuments”, you will find many castles in the four corners of our beautiful Ardèche to welcome you and bring you back to life moments of history. Discover out beautiful region on foot, on mountain bike rides, on horseback, or by car. 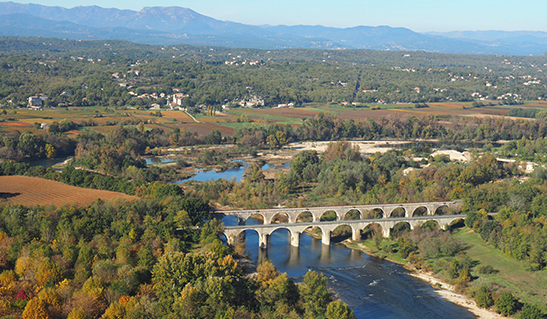 Our campsite is at the heart of Southern Ardèche. Take full advantage of our location to discover the richness of our territory and admire such a diverse landscape – a main specificity of our beautiful region. 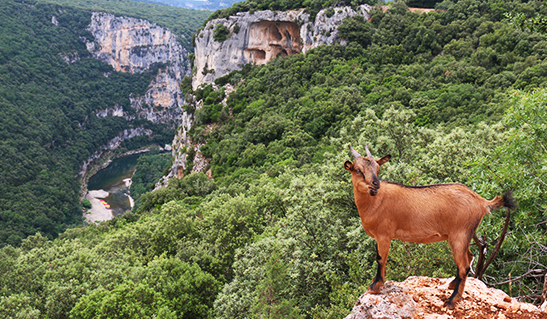 The nature reserve of the Gorges of the Ardèche offers a landscape of water, rock, and wild goat. Or simply take a walk through the Garrigues pathways, lined with colourful lavander. At reception,find leaflet guides on mountain biking and hiking to discover the region. 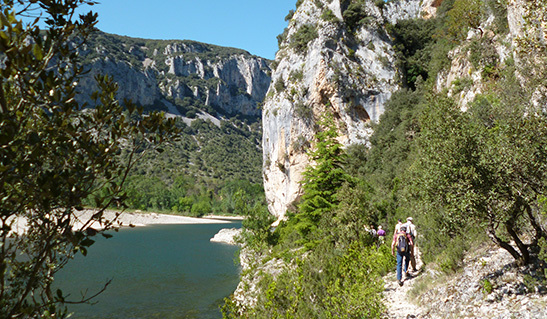 The Ardèche is also its outdoor activities! Benefiting from a favourable Mediterranean climate, to fully enjoy the great outdoors, come and discover the joys of the great outdoors with family and friends.